These will make a perfect addition to Easter baskets or a cute addition to your Spring Craft Show. In 4 plastic beakers, mix 1 oz. glycerin with 1/4 teaspoon of each powder dye. For the teal dye, add 2 oz. glycerin and 1/2 teaspoon powder. Gently blend powder into glycerin by hand, then use mini mixer to thoroughly blend powders into liquid. Set aside. For soap shreds (grass): Weigh 6 oz. of clear soap. Cut up into chunks and place in glass measuring cup. Heat in microwave until melted. Add teal green liquid color to clear soap until desired shade is reached. Mix well. Pour into 1 cavity in rectangle silicone mold. To make eggs, you will need 4 plastic beakers with 2 oz. of white soap in each. Do not melt until ready to pour. Place silicone Cake Pop mold on cookie sheet. This will help with stability if moving. Decide what order you would like the colors on your eggs. For first color (top of egg), melt the 2 oz. of white soap. Add colored liquid to reach desired shade. Pour into bottom of each egg cavity. You may have left over color depending on how deep you want the first layer. Let harden. For 2nd layer: melt 2 oz. of soap and add desired color. Spritz 1st layer with alcohol. Be sure soap temp has reached around 125 degrees before pouring so it does not melt 1st layer of soap. For 3rd layer: melt 2 oz. of white soap and add next color. Check soap temperature, spritz with alcohol and pour 3rd layer. For 4th layer: melt soap, add color. For this layer, tilt soap mold so the bottom of the egg will be at an angle. This will help the egg to lean back in the soap. Pour final layer and spritz with alcohol. Unmold teal green soap. Using a grater, grate soap for the "grass" on top. Cut up 16 oz. of clear soap. Place in glass measuring cup and heat in microwave until melted. Add teal green color and mix well. Add 1 tablespoon or .5 oz of Dewberry Fragrance oil and mix well. Pour soap into rectangle cavities and fill about 3/4 full. Spritz with alcohol. Taking a duck, spritz bottom and sides with alcohol. Place carefully in melted soap on one side of mold. You may need to hold in place or prop up with something if it falls over. While soap is setting up, remove eggs from mold. Set aside. Cut up 8 oz. of clear soap and melt in microwave. Add 1 1/2 teaspoons or 7.5 ml of fragrance. Mix well. Spritz green soap with alcohol. Once temperature has reached around 125 degrees, pour clear soap. Taking egg, spritz bottom and sides with alcohol. Place in clear soap next to duck. 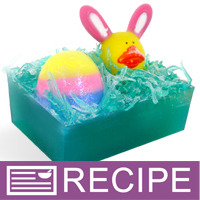 Spritz soap and eggs with alcohol and place grass around both eggs. Gently press some grass into melted soap. Taking some of the clear melted soap, drizzle lightly over grass to hold it in place. Then lightly sprinkle glitter on top. Once soap has completely hardened, remove from mold. Then, repeat to make remaining 4 bars.